After the latest and disappointing results in the mobile industry, LG retried reverse the situation to its advantage and reveals on its official website the imminent arrival of LG V20, along with some details about it. 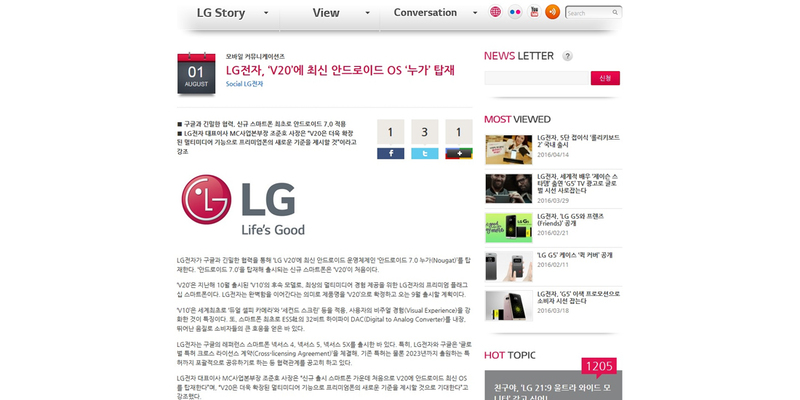 The South Korean manufacturer, newcomer of the partial failure that has led to the LG G5, whose sales have not reached the planned figures even minimally, ensures that the LG V20 represents a new standard for high-end smartphones and will have unique and advanced multimedia features. The announcement of LG is the one shown in the picture below and completely devoid of images and gives us only a few small advances in what will be the new LG V20: the device will have a dual camera also dedicated to selfies and a dual screen, thus keeping intact the peculiar features of its predecessor. LG V10 also inherits a Hi-Fi 32-bit DAC system to provide users with high-quality audio, and will be presented next month with Android 7.0 Nougat on board. We not yet know whether it will be exactly like the LG V10 in an improved version, but certainly the new model will be able to compete on equal terms with the top of the market, and perhaps a response to Galaxy Note 7, which will be presented officially tomorrow. The submission period for the LG V20 does not seem the most propitious since it will compete with the Samsung phablet, with the iPhone 7 and with the many innovations that will be presented during the IFA 2016, scheduled for late August and early September in Berlin. The presence of the new version of the operating system by Google seems to be confirmed after the recent statement by Evan Blass (@evleaks), according to which Android Nougat should be released in August for Nexus devices (except, unfortunately, the Nexus 5). Although we have no official confirmation from Google, the release of the LG V20 with the new operating system already installed lends credence to this hypothesis, and if recent years have taught us anything, it is that we will likely see it during the summer or in any case before, when it was learned that the Nexus range will have two new smartphones on the market. Therefore, we expect a late summer quite rich in news: starting tomorrow with the official announcement of Samsung Galaxy Note 7 and continue with waiting for the official announcement of Android 7.0 Nougat. The LG V20 is still a little further in time, but we are confident that this month we will have many opportunities to learn more details.